Nothing like a little vacation from reality to make you appreciate vacations from reality. I love having a family, but it’s not really possible to get very much done when they’re around. People want feeding, chauffeuring, cuddling, that sort of thing. Art, for me, is an extended and quiet process. It requires long chunks of time in which to think and feel before creation even begins, and then it wants no interruption as the new work unspools. That’s why I take writing retreats once or twice a year, sometimes with other writers, and sometimes alone. I only use the computer for work-related tasks, avoid all social media, and spend every minute I’m not writing doing something inspiring: cooking, reading, hiking. Talking about writing. It helps keep me sane. I always set a lot of rules and a lot of goals, and I usually do pretty well with both. It’s a special, sacred space and I wish I could enter into it more often. But having a family to come home to is a beautiful thing. Even though I sometimes miss having days on end filled with nothing but writing and quiet, I would miss my family more if I didn’t have them. the The kids will be able to take care of themselves someday. Not sure about The Man, though. 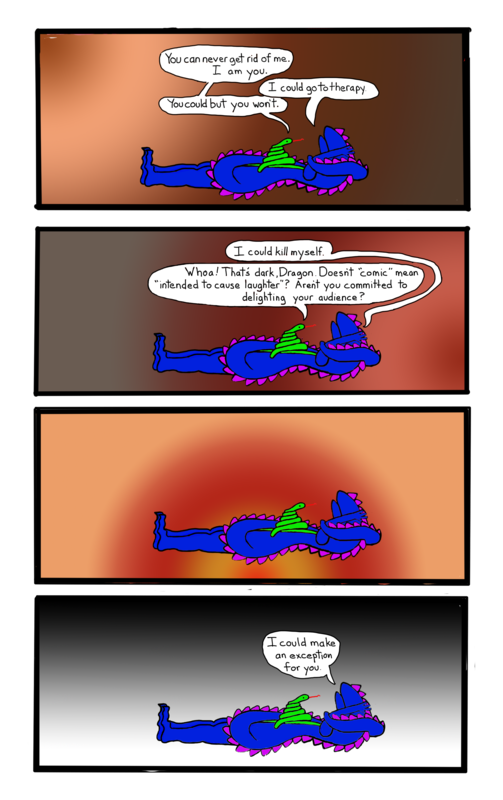 This entry was posted in comic, dragon, dragon comics and tagged comic, dragon, family, inner child, responsibility, snake, webcomics on February 27, 2015 by littledragonblue. Seriously, read M’naghten. It’s the only way to successfully plead the insanity defense. And read the DSM-V, so you can discuss antisocial personality disorder without resorting to false binaries. I really like that butterfly, visually as well as psychologically. It’s based off one in the butterfly house at the Tucson Botanical Gardens, and there will be a more detailed version on a T-shirt, most definitely. The way Dragon creeps after it in panel 4 is pretty adorable as well. In real life, you can’t really follow a butterfly. You’re better off sitting very still and giving it the chance to to come to you. It helps if you wear bright colors. That always reminds me of a coyote story, which explains why butterflies fly in such unpredictable zig zag patters. It’s because once, the butterflies played the same trick on coyote 3 times in a row without his noticing, and they can’t stop laughing about it to this day. This butterfly could be on a mission though. It might have a purpose. 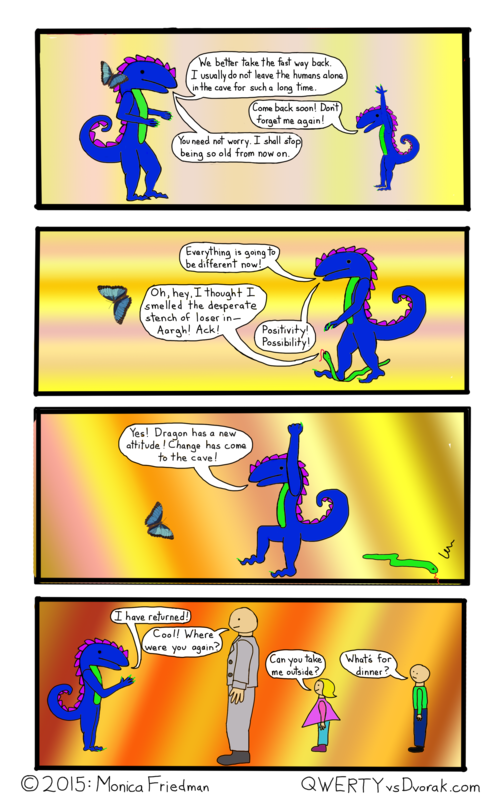 This entry was posted in Comics, dragon and tagged art, blue morpho, butterfly, dragon, drawing, futility, hope, snake on January 23, 2015 by littledragonblue. No bears were harmed by anyone other than themselves in the making of this comic. This comic is offered lovingly in honor of my friend, the bear, who creates marvelous and superlative designs, which he reproduces himself on delicate merchandise in custom colors. Each piece, and the design painted and engraved upon it, must be completely free from defect before he signs, wraps, packs, and ships it. Himself. His work is exquisite. We’ve been friends for over 20 years, and he lives 3 1/2 miles from here, and the only time I’ve seen him in the last 6 months has been in his booth at an art fair. From a financial perspective, clearly I’m going about this all wrong, but it just sort of hit me last night that finally, after a lot of years adrift (thank you very much web content for search engine optimization) my life has finally aligned itself with true north on my heart’s compass. Life is not perfect, but all the important pieces are engaged and the sun still shines in the daytime. For the bear, if he reads this, I think your way is successful too. You make a good tortured artistic soul in thrall of his cruel and lovely mistress and I hope you don’t take this the wrong way. You are a funny, grumpy, lovable old bear with whom I have not hung out in a long time. Text me. 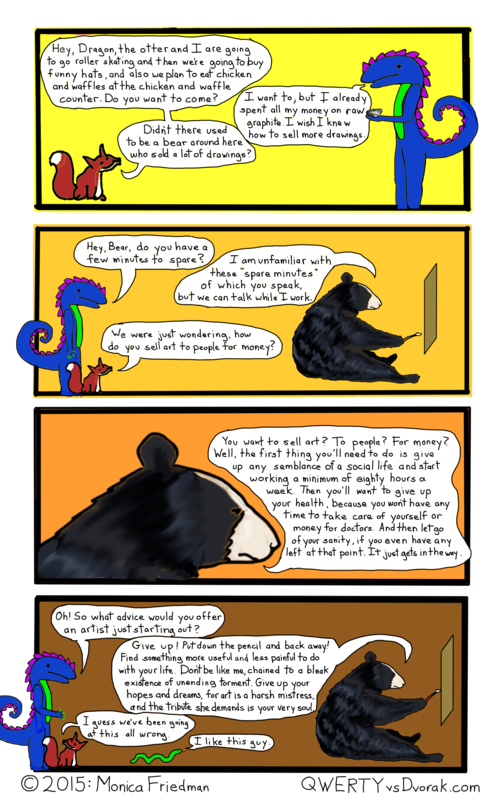 This entry was posted in Comics, Dragons and tagged art, bear, comics, determination, dragon, fox, insanity, money, perfection, snake, webcomics, working artists on January 21, 2015 by littledragonblue. Just the delightful buzzing of bees and the delicate swish of the butterfly’s wing. I know where this is coming from, but I’m not sure where it’s going. For instance, is Dragon’s meaning the same as my meaning? Is Dragon’s backstory the same as mine, and if not, how insane is Dragon’s backstory? (Because mine might be a little unbelievable, and I’m not even blue and scaly.) Still have a couple days to figure this out. At least I do know that some part of the world wants my art, because I got another sort of T-shirt commission. I’m not being paid for the design, but based on early response to news of the design, I expect to sell more than 1 as soon as it’s ready, which could be as early as tonight. It’s a commemorative T-shirt for an event come up next month, and the people attending are already a) able to afford novelty clothes and b) interested in the design’s subject matter. Most likely, you can read about/see this stunningly depraved example of outsider art in this space tomorrow morning. It’s quite different from the stuff I draw for myself, but it also helps me see how far I’ve come since I drew my first sketch on the Wacom tablet. 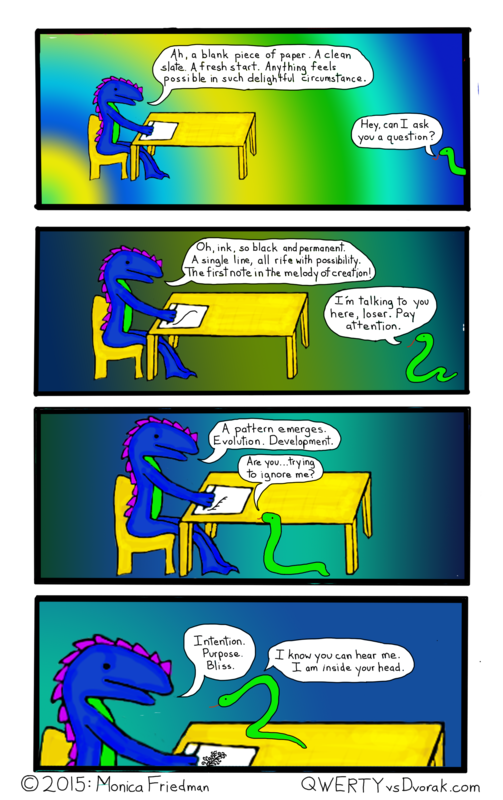 This entry was posted in Comics, dragon and tagged comic, delusion, meaning, purpose, ragon, snake, webcomic on January 14, 2015 by littledragonblue. My medium is metaphor. Mixed metaphor, I guess. It’s merely a coincidence that this 40th Dragon Comic publishes on the day on which the world marks my 40th trip around the sun. I assure you that this has no bearing on my maturity level. I do like how this arc comes sort of full circle, from satisfaction with art, to dissatisfaction with art, to depression about art, to straight up depression, to comedy about depression, and back to satisfaction with art. There’s something classically right about black humor (thus, Dragon holds a copy of Hamlet, one of the best examples of gallows humor, in panel 1) because as long as we can laugh at our terror, our pain, and our uncertainty about life, we know that these things have not yet consumed us. When Hamlet fools with Yorick’s skull in the graveyard, it gives him, at last, the presence of mind to consider his own inevitable death while stirring in him the sensations of life. Ophelia’s death, and the clowning around it, spurs him on to the death and violence of the play’s conclusion. We all die, so why not keep merry? Whether or not Hamlet avenges himself on Claudius, he and Claudius and everyone else will die, like his Yorick, like his father, like Ophelia. Love cannot save us from death, but humor can save us from fear. I’m 40. I’m mortal. I’m going to die. But until then, I’m going to laugh. Even when I’m depressed, I’m going to laugh. 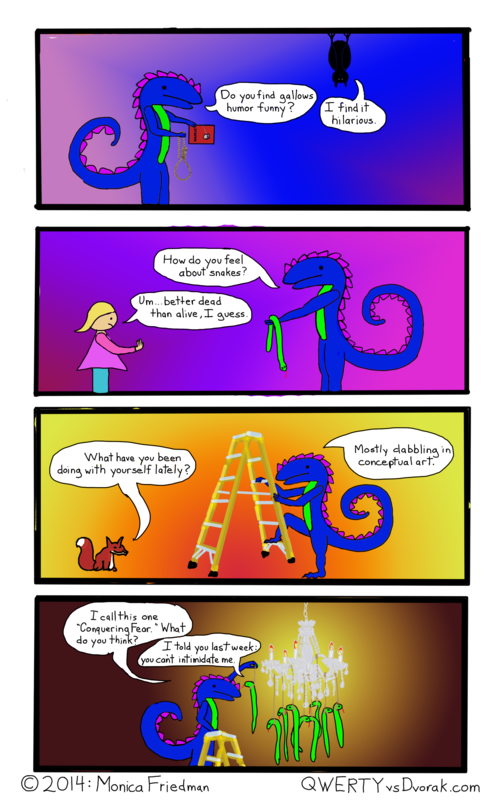 This entry was posted in Comics, Dragons and tagged black comedy, bleak, clowning, comedy, comic, conceptual art, depression, dragon, fox, funny, gallows humor, hope, snake, webcomic on November 19, 2014 by littledragonblue. Depression sits right on your chest. Don’t feel sorry to me. I had an excellent weekend and had to scramble to finish this comic even though it was halfway done Friday afternoon. But instead of drawing, I had a good time and enjoyed myself in every possible way from then to now. I am not personally depressed now, but I do know what it’s like to have depression sitting on your chest, weighing down your every thought. That experience is known to me. 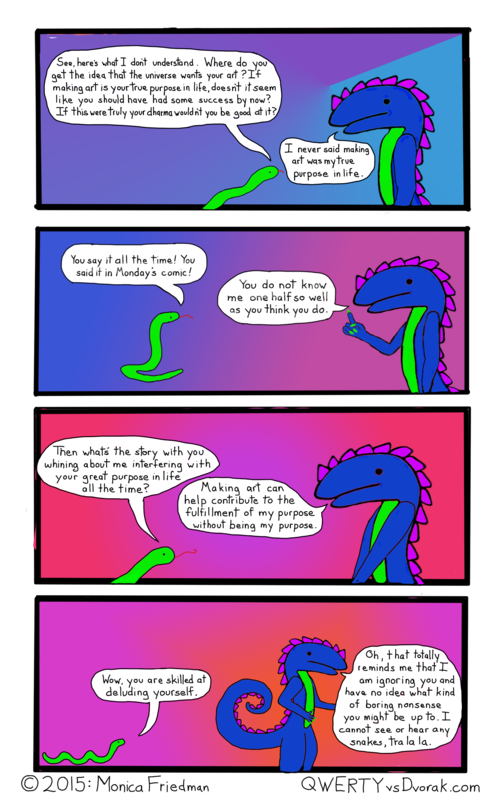 This entry was posted in Comics, Dragons and tagged comedy, comic, depression, dragon, snake, therapy, webcomic on November 17, 2014 by littledragonblue.